A compassionate police officer is being praised for the kindness that she showed towards a man who had his groceries stolen while he was having a diabetic episode. 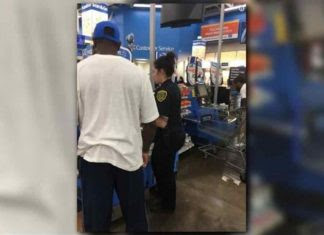 Officer Kirsten Koryciak had been stationed at a Walmart in Houston, Texas when she saw a “groggy-looking” customer come back into the store. The man walked up to the police officer and told her that he had just had a diabetic episode. While he was being treated, someone had taken his groceries. Since the man was on a fixed income, he was unable to buy more food. Without hesitation, Koryciak used her own money to replace all of the man’s groceries – roughly $30 worth of vegetables, medication, and meals. When she was later interviewed for her act of kindness, Koryciak explained that many of her family members have struggled with type 1 diabetes in the past, and she understands how awful the disease can be. Additionally, she simply said that helping the man was the right thing to do.